Competitive junior golfers have the opportunity to work with former college coaches including legendary two-time NCAA Championship Coach, Rick LaRose. 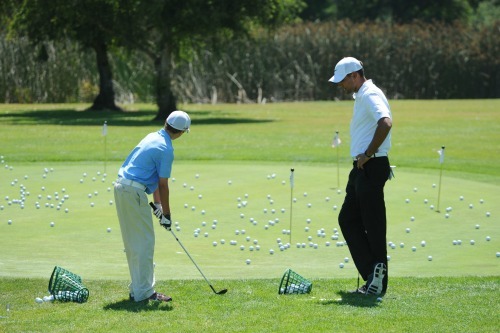 (PRWEB) March 19th, 2015 – Nike Golf Camps has expanded their programming with the addition of College Golf Development Camps in Arizona and Florida. These programs are specifically designed for the competitive junior golfer looking to lower their score in a golf-intensive environment and to learn about what it takes to make it through the college recruiting process. The coaching staff, led by University of Arizona coaching legend, Rick LaRose, spends significant time evaluating each student, educating the student-athlete on the knowledge gaps as it pertains to the recruiting and college search process, and assisting in creating plans to work towards their long term goals. Rick LaRose is the former University of Arizona Head Men’s and Women’s Golf Coach, a position he held for over 30 years. He is the only coach in NCAA history to win both a men’s and women’s NCAA National Championship. Joining LaRose is former Duke University Men’s Associate Head Coach, Jon Whithaus, and former NCAA DI and DIII coach, Brendan Ryan. The curriculum consists of morning instructional groups with emphasis on short game, putting, full swing, and proper practice routines. A student-to-teacher ratio of 4:1 enables the coaches to work intimately with each camper. Afternoons are dedicated to course play in a competitive, tournament environment. On top of group instruction and on-course practice, junior golfers receive 1-on-1 video analysis to work on their swings throughout the week. Evenings are spent discussing long-term development, college golf preparation (resumes, NCAA clearinghouse), goal setting, and tournament preparation. At the conclusion of camp, staff members offer informational question and answer sessions with parents and athletes to address next steps, goals, and best practices. Nike College Golf Development Camps are all-inclusive overnight programs. Two programs are offered this year in Phoenix, AZ and Lake Mary, FL, near Orlando. The Phoenix program is held at Legacy Golf Club and Marriot Buttes Hotel and runs from June 5th – 7th. The Lake Mary session is hosted by Timacuan Golf and Country Club and the Orlando Marriott Hotel. Session dates are June 9th – 11th. The camp is co-ed and is suitable for advanced golfers, ages 13 – 18. Visit Nike College Golf Development Camp, Phoenix and Nike College Golf Development Camp, Florida for complete information and registration.